“An Act to authorize the establishment of a life-saving station on Ocracoke Island, on the coast of North Carolina. “Be it enacted by the Senate and House of Representatives of the United States of America in Congress assembled, That the Secretary of the Treasury be, and he is hereby, authorized to establish a life-saving station on Ocracoke Island near Ocracoke Inlet, on the coast of North Carolina, at such point as the General Superintendent of the Life-Saving Service may recommend. “Sec. 2. That the character of the equipments and appliances of the station and the station building shall be determined by the General superintendent of the Life-Saving Service. Ocracoke native, David Williams, was appointed keeper on May 23, 1905, and was still serving in 1915, when the Life-Saving Service joined with the Revenue Cutter Service to form the US Coast Guard. 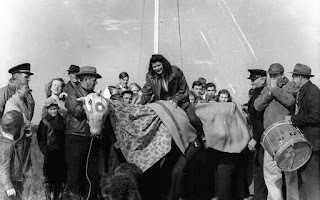 This month's Ocracoke Newsletter is about Old Christmas in Rodanthe. You can read it here: https://www.villagecraftsmen.com/old-christmas-rodanthe/. The first mention I could find of a snow at Ocracoke was on April 15, 1770. It was then that the Lillie, on her way to Ocracoke under command of Captain Ewer, wrecked about 10 miles north of the village. Although the crew and cargo were saved, the vessel, a snow, was lost. You read correctly...I am writing about a square-rigged sailing vessel, not winter precipitation. A snow (according to Wikipedia, "[t]he word 'snow' comes from 'snauw' which is an old Dutch word for beak; a reference to the characteristic sharp bow of the vessel.") was a ship with two masts plus a "snow mast." The latter had a loose-fitted gaff sail, and was stepped immediately behind the main mast. 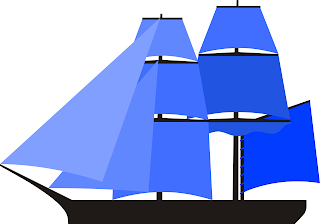 In the diagram below you can see that the gaff sail (a four-cornered, fore-and-aft rigged sail, supported by a spar or pole called the gaff) is attached to a separate mast directly behind the main mast. Snows were popular, especially in Europe, from the late 17th century, and were still to be seen in North Carolina one hundred years later. I am sure that most of our readers are aware that Edward Teach (the pirate Blackbeard to most) was killed in a naval battle here at Ocracoke. The event took place almost 300 years ago (in November, 1718), and has been told many times. Few of our readers will know much about Lt. Robert Maynard, born in Kent, England, circa 1684, and the lieutenant in the Royal Navy who engaged Blackbeard in battle. 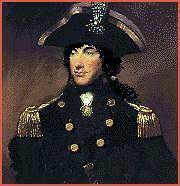 He was an officer of His Majesty's man-of-war Pearl stationed in Hampton, Virginia. In November, 1718, Maynard was sent to North Carolina by Alexander Spotswood, Governor of the Colony of Virginia, to capture Blackbeard in an effort to curtail piracy along the Atlantic seaboard, and to divert attention from his own troubled relationship with the Virginia Council. Spotswood gave Maynard command of two sloops, Ranger and Jane. Details of Maynard's final battle with Blackbeard have been well documented and are available in books, magazines, and on-line articles. At the conclusion of the bloody naval engagement Blackbeard was beheaded. His head was hung from the bowsprit of Maynard's sloop and taken back to Virginia. Upon returning to his home port Maynard impaled the head on a stake near the mouth of the Hampton River. In 1739 Maynard was promoted to commander, and in 1740 to captain. Robert Maynard retired to Great Mongeham in Kent, southeast England, near the port of Deal on the English Channel. He died in 1751, and is buried in the parish churchyard, on the outskirts of Deal. Parts of the church, St Martin's, date to the 13th century. On a monument on the northeast buttress of the church tower are these words: "To the Memory of Capt. Robert MAYNARD a faithfull & experience’d Commander of the Royal Navy; who, after he had distinguish’d himself by many brave and gallant Actions in the Service of his King and Country retired to this Place where he died 1 Jan. 1750-51 aged 67." Maynard's victory over Blackbeard is still celebrated in England. The crew of the current HMS Ranger, a patrol and training vessel of the British Royal Navy, commemorate Blackbeard's defeat annually as close as possible to November 22 at the Sussex University Royal Naval Unit Blackbeard Night Dinner. Yesterday I wrote about the ill-fated barkentine, Vera Cruz VII, which wrecked on Portsmouth Island in 1903. The Vera Cruz carried 22 crew members and 399 black Portuguese passengers from the Cape Verde Islands. A reader left a comment, including this observation: "It is any anyone's guess as to where they were headed." Although Captain Julius M. Fernandez, "a notorious smuggler, not only of dutiable goods but of men whom the laws of this country would prevent from landing," claimed he was seeking fresh water, "many believe he was trying to land his passengers in a secluded area, in an attempt to avoid customs and immigration officials." Captain Fernandez reportedly "left the country, without being caught, in a sperm oil barrel aboard a New Bedford whaler." 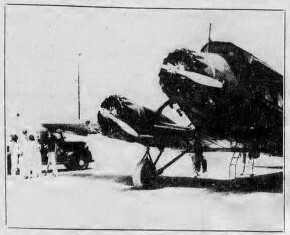 The passengers had left the Cape Verde Islands because of famine and hunger. The New Bern Weekly Journal of August 4, 1903 reported that "the situation on the island of St. Thiago is particularly distressing. Old and decrepit people drop dead in the street and babies die of starvation...."
The passengers were transported first to New Bern, North Carolina, and from there to New Bedford. On October 23, 1903, the New Bern Daily Journal reported that, "A.B. Dawson, who went to New Bedford, Mass last week to secure Portuguese laborers for persons here returned with them yesterday on the steamer Ocracoke. There were 106 in the number, 12 or 15 of them being women. It will be remembered that these Portuguese are the same who were brought here last spring from the wreck of the Barkentine Vera Cruz VII near Ocracoke and later taken to New Bedford for which place they were bound when the wreck occurred." The workers were praised for being "industrious, honest and faithful." In 2011, Penny Akahloun, a retired American diplomat who served in the U.S. Foreign Service for forty-three years, (see http://adst.org/wp-content/uploads/2013/12/Akahloun-Penny2.pdf) contacted me after reading about the wreck of the Vera Cruz VII. Penny's grandfather was one of the Portuguese passengers from the Cape Verde Islands, bound for New Bedford, Massachusetts. Penny was so impressed with the hospitality of the Portsmouth Islanders (who fed and sheltered the survivors) that she made the trip to Ocracoke for the 2011 spring meeting of Friends of Portsmouth Island, where she spoke about her research and emotional connection with Portsmouth. She wanted to visit the village whose people, in 1903, went out of their way to care for her grandfather and other shipwreck victims from a foreign country. Penny has written a book about her personal and professional journey, The Magic of Dreams: An American Diplomat's Journey. Ocracoke Island native Isaac Willis O'Neal (1865-1954) joined the United States Life Saving Service in 1904, and served until 1917, at which time the USLSS merged with the Revenue Cutter Service to form the United States Coast Guard. On July 22, 1939 Surfman Isaac (Big Ike) O’Neal shared his life story with his daughter Elizabeth. There has always been controversy about Ann's true birthday and age at death. I wrote about her in a 2013 blog post. According to the markers in the cemetery, Ann was 25 years older than her husband...curious and unlikely, but certainly possible. Also, family genealogy indicates Ann and George's last child, Mary Elizabeth, was born in 1785, when George would have been 36 years old; Ann would have been 61 years old...highly implausible. The Tarboro Press (November 6, 1841), stated, "Mrs. Ann Howard died a few days past on Ocracoke at age 115." I was recently given a copy of a petition by William Howard (1776-1851), son of George and Ann Howard) to the Court of Pleas & Quarter Sessions September Term 1835. According NCpedia, "The Court of Pleas and Quarter Sessions served as the civil, administrative, and judicial arms of North Carolina county government beginning in the Proprietary period (1663-1729)....[T]he court heard cases in which the amount of litigation was between 40 shillings and 20 pounds, as well as a variety of minor civil and criminal actions," including "the settling of estates." The petition states that William's mother, Ann, "is now one hundred, and eight years of age, a lunatic, and so feeble and impaired both in mind and body, as to be incapable of taking care of herself, or property." If Ann Howard was 108 years old in 1835, she would have been 114 years old at her death in 1841. So, at the time of her death was Ann Howard 117, 115, or 114 years old...or perhaps significantly younger? We will probably never know. But one thing seems certain -- her family thought she was very old! 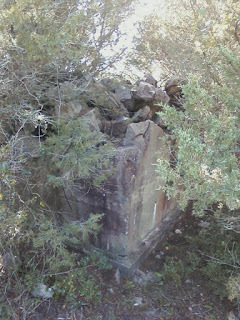 On a small hill on the southeastern edge of Ocracoke village, obscured by cedars and other vegetation, is the crumbling concrete base of the "Loop Shack," a control hut where, during WWII, signals from underwater magnetic loops were monitored to detect off shore German U-boats by electromagnetic induction. "Indicator loops," as they were called, were long lengths of cable laid on the seafloor. 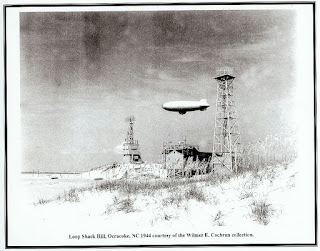 Developed by the British Royal Navy in the early 20th century, they were tested at the end of WWI, and employed in various locations around the world, including Ocracoke Island, during WWII. When a submarine (which acted as a magnet) passed above the indicator loop, an induced current was produced and recorded on a paper chart, thus signaling its presence to the operator in the loop shack who could then detonate mines to destroy the submarine. During the first half of 1942 more than 200 merchant vessels were sunk by German U-boats along the Eastern seaboard, more than 60 off the North Carolina coast. In the summer of 1942 the Navy began construction of a U.S. Navy Section Base in Ocracoke village (where the NPS Visitors Center, NC Ferry Operations, OPS Museum, and parking area are located today). The Base was commissioned October 9, 1942. At the same time an indicator loop was laid off shore, and a loop shack was built on what was then a large dune separated from the ocean by tidal flats. Various support buildings were added nearby. By the time the Base was completed the Navy was aware that U-boat attacks had already stopped. In 1944 the Base was converted to a top-secret Amphibious Training Station. In 1945 the Base became a Combat Information Center. Below are several photos from yesterday's snow for our readers who are not on Facebook. Enjoy! Every year the residents of Rodanthe on Hatteras Island celebrate Old Christmas with feasting and merriment. This month's Ocracoke Newsletter is about how this event came to be. You can read it here: https://www.villagecraftsmen.com/old-christmas-rodanthe/. The Gulf Steam is a warm water current about 60 miles wide and, in places, almost 4,000 feet deep. It originates in the Gulf of Mexico, and flows along the eastern seaboard of the United States and Canada before crossing the Atlantic Ocean. Its maximum speed is approximately 5 1/2 miles per hour. The cobalt-blue Gulf Stream, which flows about 30 to 50 miles offshore, has a major influence on the climate of North Carolina. The warm current (about 60 degrees in the winter) creates milder winter temperatures, particularly along the Outer Banks. 80 degree water temperature in the summer draws tourists to the Banks for swimming, surfing, snorkeling, birding, and just relaxing on the beach. Gulf Stream fishing is a major industry from Oregon Inlet to Ocracoke Inlet. "The action of a Wilmington man in seeking to deride the Gulf Stream in an article in a well known state magazine two weeks ago is a little beyond our understanding. He claimed to quote official sources of information, yet a careful perusal of the article leads to the impression that the quotations were carefully selected for the purpose of being misleading. "The gentleman says the Gulf Stream is 100 miles off Southport. In the face of this claim the writer has a telegram from J. H. Hawley, acting director of the U.S. Coast and Geodetic Survey, who asserts that the approximately inner edge of the stream is 35 miles south east of Cape Fear. And the Wilmington man takes a dig at the Wilmington, Morehead City and Beaufort Chambers of Commerce and at the Southport Civic club for boasting a climate influenced by the Gulf Stream. Our answer to this is that if he does not like the climate along the coast he is perfectly welcome. In fact we will be glad to see him take himself further away from it. The Gulf Stream does not need ‘debunking’ from a man who know nothing about it. When the true facts about it and what it means to our coast are brought out it will be found to be worth vastly more than the average citizen now dreams of. Meanwhile, we are more than willing to accept the findings of the United States in preference to those of an illinformed individual." NO PLANE IS TOO large to land on the mile-wide beach of Ocracoke Island. Aviators who have landed there say it is the largest natural airport in the world. The above picture was made on Ocracoke beach a few days ago. It shows a partial view of the big 3-motored Stinson owned by Mayor R. J. Reynolds of Winston-Salem. In this plane, Mayor Reynolds, who is also treasurer of the National Democratic Committee, gets about the country in a hurry. Ocracoke Island was shocked to the roots of its so called Elizabethan foundation when the first trial in approximately 30 years was heard before Justice of the Peace Harvey Wahab. The news of the scheduled hearing swept over this sandy soil like a prairie fire and the natives from all over the island flocked to the courthouse building to hear the testimony, Mackley [Maltby] Bragg was charged with assault on the person of Stanley Wahab. He was found guilty of the charge and received a 30 day road sentence suspended upon the payment of $10 and cost and on the good behavior of the defendant for a period of six months. The trial and the events leading up to it has been called the "news of the year." For a period of 30 years Ocracoke has been known as the one place in North Carolina without any form of law. It received much publicity due to the fact that it did not have a jail, any law enforcement officers, and there are no license plates on the cars and no licenses for driving. The fact that the problems of civilization were slowly encroaching this island of legend became evident in 1950 following the construction of Scott's Highway. The citizens were faced with the problems of speeders along the narrow highway which had been called the road which "started from nowhere and ended at the same place." 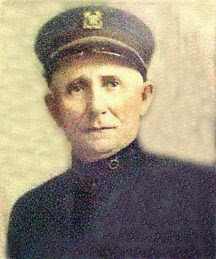 In order to check the speeders and the Saturday night celebrators, Ausley [Ansley] O'Neal was appointed Deputy Sheriff. Additional problems appeared when it was discovered that following an arrest the defendant and all witnesses were forced to travel through four counties to get to Swan Quarter, the county seat of Hyde County. This trip, due to the boat and bus schedule, requires a period of four days. As the result, the deputy sheriff didn't have too much business. In order to offer a solution to the problem, Harvey Wahab, a retired Coast Guardsman, was appointed Justice of the Peace. He received his appointment in the spring and today was his first trial. Recent after-dinner conversation at my house turned to burial practices and cremation. I was reminded of a customer at the Village Craftsmen a number of years ago. A congenial elderly couple came into our gallery. While I was chatting with the woman I nodded toward the gentleman with her, and referred to him as her husband. "Oh, he is not my husband," she countered. "My first husband is here," she said, pointing to the locket-type earring dangling from her right ear. "And my second husband is here," she added, touching her left earring. Noticing a matching locket on a chain around her neck, and nodding to the gentleman with her and pointing to the necklace, I remarked, "So, I suppose he will go there." "Oh no," she quickly informed me, "that's my dog." You meet the most interesting people at Ocracoke! Access to Ocracoke is by state-operated ferries, private boat, or airplane. In the '30s and '40s pilots landed on the beach. 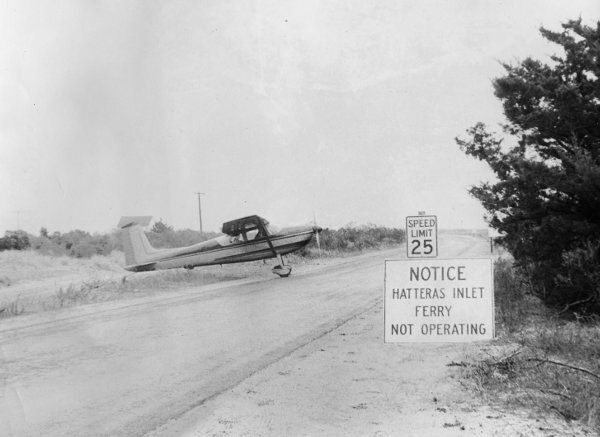 After NC12 was completed in 1957 pilots often used the new highway as a runway. Sam Jones (1893-1977) liked to fly to Ocracoke from Norfolk, Virginia. He was a colorful entrepreneur, originally from Swan Quarter, NC, who married Ocracoke native Mary Ruth Kelly. Among other things, Sam was an early promoter of a paved airstrip on Ocracoke Island. With the help of Albert W. Cowper, Resident Superior Court Judge of Lenoir County, and an avid sailor who frequently visited Ocracoke, Sam made contact with Kinston attorney, Thomas J. White, chairman of the NC Advisory Budget Commission and chairman of the Senate Appropriations Committee. White, incidentally, was an avid fisherman and hunter who loved Ocracoke Island and the Outer Banks. As the result of considerable lobbying by Judge Cowper, Mr. Jones, and others, appropriation for the 3000 foot paved airstrip was approved, and it was built in the early 1960s. In 1964, Sam Jones, newly enthusiastic about easier air travel to the island, commissioned a sign to be placed at the airport. 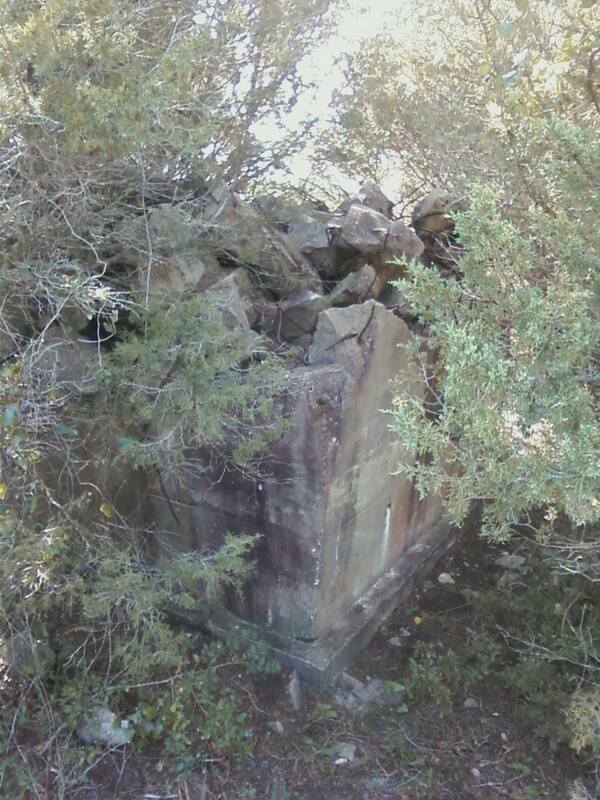 It read, "White-Cowper Airport." Sam is reported to have remarked, "I named the Ocracoke airstrip 'White-Cowper Airport' because Senator Tom White got the money appropriated, and I named it for Judge Albert Cowper for getting Tom White to do it." It has been many a year since any sign advertising the White-Cowper Airport has been displayed on Ocracoke Island. Few people even remember the sign, and I have been unable to locate a photo of it. I wonder by what authority (if any) Sam named the Ocracoke Airport, and if the airport has an official name in any state documents. It would be interesting to find out. This article in the Ocracoke Observer describes a 2016 visit to the island by Conor & Sam Dancy in their rented Skylane airplane: https://ocracokeobserver.com/2017/02/26/outbound-to-ocracoke/. Junius Harris Fulcher was born in the small village of Frisco on Hatteras Island in 1876. He was the son of George Leffers Fulcher and Cynthia Stowe. George Fulcher (born 1839) had worked as an inlet pilot, fisherman, teacher, and Methodist minister. Like so many young men from the Outer Banks, Junius entered the US Lighthouse Service. In July, 1918, when he was 42 years old and married with an eight-month-old daughter, Junius was called into service with the Naval Reserve. Junius Fulcher served as Lieutenant (junior grade) on board the USS Ticonderoga, a 5130 gross ton cargo ship under charter to the United States Navy. The Ticonderoga was built at Bremerhaven, Germany in 1914 as the German flag merchant steamer Kamilla Rickmers. The ship was seized by the U.S. Government in 1917, and renamed Ticonderoga later in that year. On September 22, 1918, the Ticonderoga left New York on her fourth voyage to France. Eight days later a German U-boat, U-152, surfaced in her path. Commanding officer, James J. Madison, attempted to ram the submarine, but missed by just a few feet. The U-boat attacked, critically disabling the Ticonderoga, and killing and injuring many of the crew, including the captain. Seriously wounded and losing consciousness, Madison ordered his crew to abandon ship as it sank. His lieutenants, Frank L. Muller and Junius Fulcher, were placed in charge. 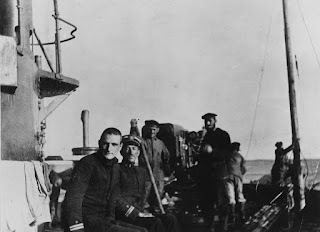 Of the ship’s 237 crew members only 22 sailors and the two officers survived the battle. Lt. Junius Fulcher, badly wounded, and Executive Officer, Frank Muller, were picked up by the German submarine and taken aboard as prisoners of war. Junius Fulcher was treated by the U-boat’s doctor and recuperated well. After the November 11 Armistice, Fulcher and Muller were released in Harwich, England. Fulcher returned to work with the US Lighthouse Service, where he served for 40 years. He and his wife Grace had one more child, a son. Junius Fulcher died in 1967 at the age of 91 in Norfolk, Va.
James Hardy Overton met and befriended Junius Fulcher around the turn of the 20th century, some years before Fulcher’s fateful encounter with U-152. Impressed with Fulcher’s character, Hardy Overton named his first son Junius Fulcher Overton. Years later, Junius Overton’s two daughters, Margaret and Kay, married Ocracoke men, Danny Garrish and Mike Riddick. A number of the family continue to live on Ocracoke Island to this day. OCRACOKE ISLAND’S postoffice is located in Big Ike O’Neal’s store located on the shores of Silver Lake Harbor in the center of the community. Postmistress at the present time is Miss Elizabeth O’Neal, daughter of Big Ike. 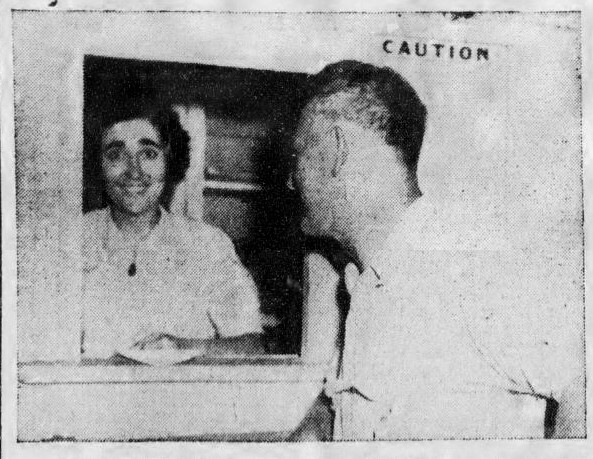 She is shown in the above picture selling a money order to Walter O’Neal, island merchant. Ocracoke, according to its per capita, probably issues more money orders than any other community in the world. Tom Howard, retired postmaster there, once told the Beaufort News Editor that the annual sale of money orders amounted to $36,000 – (Photo by Aycock Brown). The Post Office/Big Ike's Store was severely damaged in the 1944 hurricane. A new Post Office was then built nearby (where Down Point Decoys is today; that Post Office was moved, and is now a rental cottage behind Captain's Cargo gift shop). 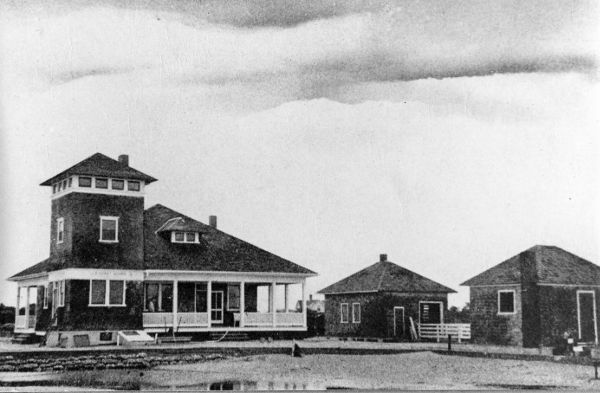 Captain's Landing Motel sits approximately where Big Ike's store was located. It is owned and operated by Betty Helen Chamberlin (Big Ike's granddaughter/Elizabeth O'Neal Howard's daughter) and her husband George. Elizabeth always insisted there was no such thing as a postmistress. She was the postmaster! Many of our readers will remember Merle Smith Davis. Merle died Thursday, December 28, 2017, at her home on Ocracoke Island. Merle was born in Durham, NC, and grew up in Chapel Hill. She graduated from Chapel Hill High School in 1962, and attended the University of North Carolina at Greensboro and received her education degree from the University of North Carolina at Chapel Hill in 1966. Merle moved to Ocracoke in the mid 1970s, and was an active member of the community. She added a creative touch to nearly every endeavor she pursued. A friend recounted being invited to her home for lunch after teaching a pottery class at the Methodist Church. "The plate was decorated with candied violets!" he remembered with glee. Her house on Howard Street, outside and inside, was as much a gallery of folk art and contemporary crafts as a home. First time visitors to Ocracoke, when strolling down Howard Street, would sometimes walk into her house, thinking it was the Village Craftsmen! Merle even entered the local vernacular. When someone decorates or dresses in an especially colorful and creative way islanders are wont to exclaim, "That is right Merley, isn't it!" Merle moved off the island for a time, then returned to teach in the local school. For the last 25 years she had been the Arts Administrator for her husband, Donald Davis, nationally known storyteller. Merle and her enthusiasm for life will be greatly missed! You can read Merle's obituary here: http://www.ocracokecurrent.com/153967. 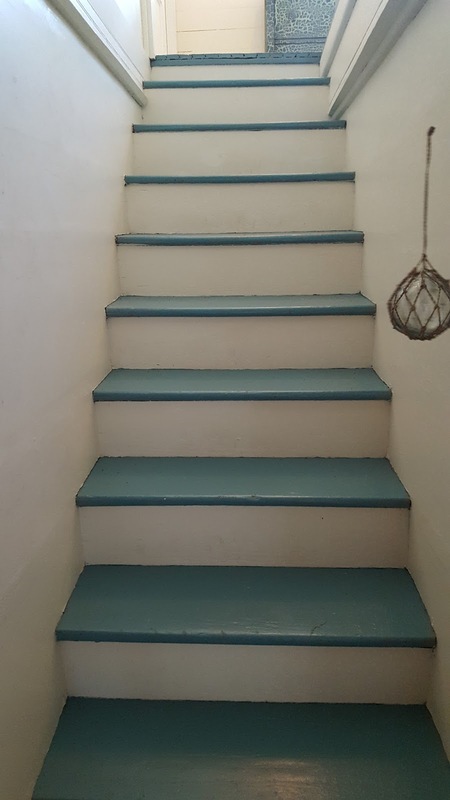 Last year I was visiting a friend in her new (actually old) house. She had just purchased a 100-year-old island home. Although it now has a modern kitchen, two bathrooms, central heat & A/C, and up-to-date wiring, it still maintains its original character. 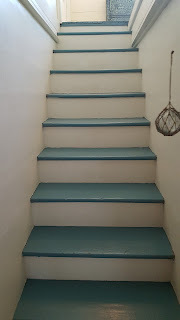 The ceilings are low, interior walls are paneled with bead board, and the stairs are narrow. 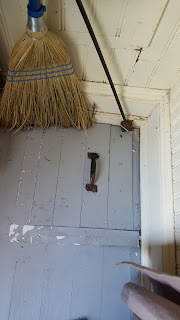 The new owner made a special effort to show me the trap door in her small utility room. 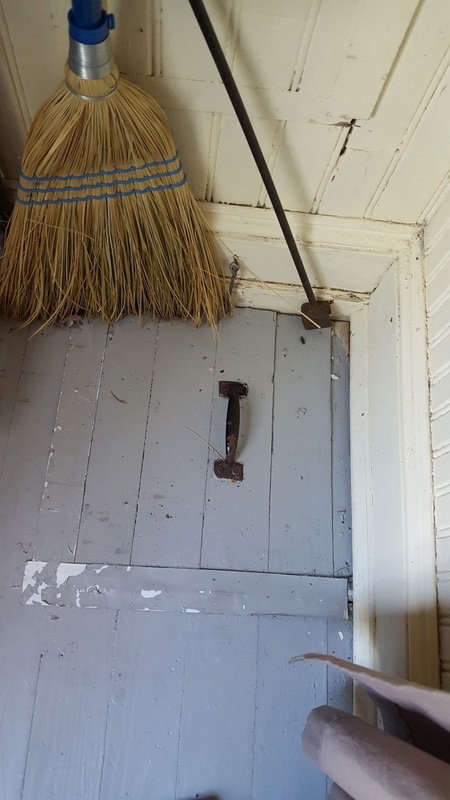 I am wondering how many of our readers know why this trap door was cut in the floor of this old house. Leave a comment if you think you know.